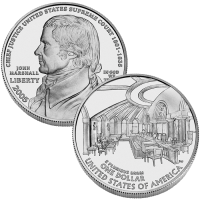 Appearing as the first commemorative release of 2005 from the US Mint was the 2005-P Chief Justice John Marshall Uncirculated Silver Dollar. This coin honors the fourth ever Chief Justice of the United States Supreme Court John Marshall who served in that capacity for an astonishing 34 years. During his tenure, many landmark decisions were made by the court preserving Marshall a position of respect among many. The coin also honors the Supreme Court itself as well as the entire judicial branch. The US Mint assesses a surcharge to the sale of each commemorative coin it sells with any funds raised being forwarded to the organization dictated by the legislation that authorized the coins. The initial price charged for the Chief Justice Marshall Uncirculated Coin was $33.00. 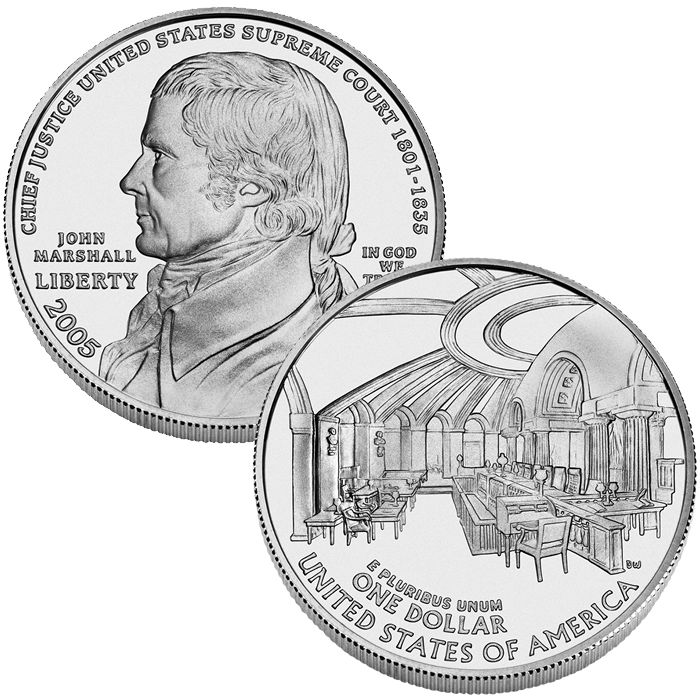 A profile of John Marshall is shown on the obverse (heads side) of the Chief Justice Coin. It was engraved by John Mercanti. The reverse (tails side) shown an image of the old Supreme Court Chamber. It was engraved by Donna Weaver.